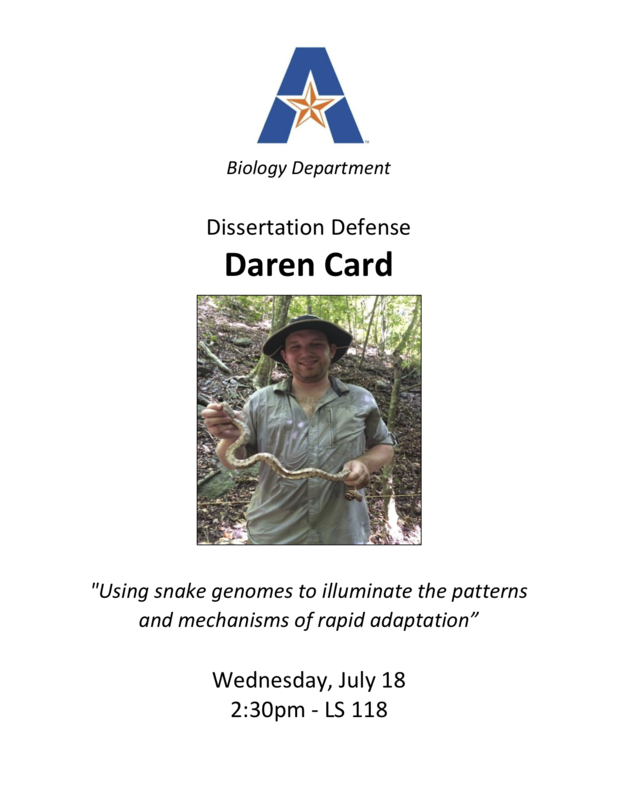 Dissertation Defended - Daren Card, Ph.D. Yesterday, I completed the final step of my doctoral degree, defending my dissertation. The dissertation is entitled “Using snake genomes to illuminate the patterns and mechanisms of rapid adaptation”. I’m happy to report that it went well! I am grateful to the many people who entered my life since I began this dissertation. Thank you to my close friends and lab mates in the Castoe Lab: Rich Adams, Blair Perry, Audra Andrew, Giulia Pasquesi, Nicky Hales, Andrew Corbin, and Jacobo Reyes-Velasco. Drew Schield deserves special recognition, as we both moved to the area and commenced our research at the same time, making him essentially an academic twin. This group has enriched my life greatly with a combination of intelligence, colleageality, compassion, patience, and encouragement, and my research would not have been possible without them. Several collaborators outside the lab have been particularly rewarding to work with, including the groups headed by Drs. Tereza Jezkova, Heath Blackmon, Maggie Hunter, Kristen Hart, Chad Montgomery, Scott Boback, and Warren Booth. Thank you to the many friends and colleagues I have met since arriving at UT-Arlington, especially Jill Castoe, Eli and Rachel Wostl, Alex Hall, James Titus McQuillan, and Kyle Shaney. To my committee members, Drs. Esther Betran, Jeff Demuth, Matt Fujita, and Matt Walsh: I am grateful for the encouragement, knowledge, and ideas that you provided, which greatly improved my research. Thank you to the administrative staff in the biology department – Sherri Echols, Gloria Burlingham, Ashley Priest, and, especially, Linda Taylor – for all of the help. Special thanks to Corey Roelke for helping me with the fun and rewarding experience of teaching others. I am eternally grateful for the support of my parents, Gary and Claire, who raised me to love science and strive to do my best in everything, and to my brothers, Jay and Andrew, the best friends that nature can provide. Thank you to my wife, Rachel, for whom this dissertation is dedicated; I look forward to continuing life’s journey with you. Finally, no one will ever replace the unparalleled friendship and mentorship of my advisor, Todd Castoe, which I have internalized and will strive to replicate in my future.